Enter the world of basic robotic technology and build your own robotic arm with five motors and five joints. 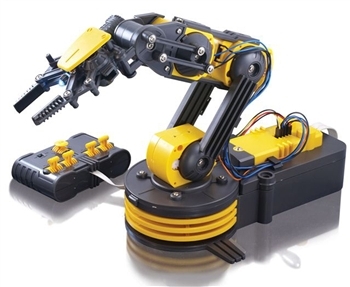 The arm features a five-switch hard-wired control unit, a rotating base, elbow and wrist articulations, and a functional gripper. The built-in searchlight brings more fun when operated in the dark. Specially recommended for robotics practices in technical and professional schools.